The Goodwood Festival of Speed is the season's most important motoring event and is a fixture on every car enthusiast's calendar. This year's Goodwood Festival of Speed theme is Racing Revolutions - Quantum leaps that shaped motorsport so visitors can expect to see an abundance of current and historic racing models alongside racing drivers of all ages, as well as a celebration of 100 years of the Indianapolis 500. As part of their support for National Motorsport Week the last four British-born Formula One World Champions, Jenson Button, Lewis Hamilton, Damon Hill and Nigel Mansell, will be in action on the 1.16-mile hillclimb course. Cars can also be seen in action on the Forest Rally Stage while more peaceful displays include the Cartier 'Style et Luxe' and the Supercar Paddock. The Alfa 4C concept car will be making its public UK debut at Goodwood. A classic two-seat, mid-engined, rear-wheel drive coupé built with lightweight materials mean that it weighs less than 850kg. The 200bhp 1,750cc petrol engine propels it to a top speed of 155mph while 62mph comes up in less than five seconds. The £79,950 BAC Mono road/track car, designed by brothers Neill and Ian Briggs, will be shown for the first time. Offering the thrills of a single-seater in road-going form it can hit 60mph in 2.8 seconds and 100mph in 6.7 - on the way to a top speed of 170mph. Highlights from BMW include the first public outing for the new BMW M5 saloon and Le Mans race ace Dirk Müller driving the BMW Z4 GT3. Bugatti will be showing the Veyron 16.4 SuperSport, the world record holder with a top speed of 268mph. The Citroen stand will host the premiere of the Citroen DS4 alongside the all-electric Survolt supercar concept, while the DS3 R3 rally car will be in action on the Forest Rally Stage. Ferrari will be showing the FF, its new V12 four-seater alongside the front engined V8 California and the mid-rear engined 458 Italia. The Abarth 695 Tributo Ferrari is insanely priced at nearly £30,000 - yet we can’t help admiring it. Make your mind up for yourself by visiting the Fiat stand where it will be displayed. The 1,200bhp V8-powered Hennessey Venom GT will be shown at the festival. A top speed of 275mph and a 0-60mph time of 2.5 seconds mean that a whole new generation of schoolboys will be eager to see the Top Trumps winning American supercar. 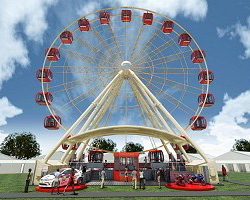 Honda will be unveiling two firsts at Goodwood: the Honda Eye, a 40-metre high, 24-pod Ferris wheel and the Mugen version of its CR-Z hybrid coupé. The Honda Eye will offer free-of-charge views of the Goodwood Estate and runs in 10-minute rotations from 9am until 6pm each day. Jaguar’s contribution includes a 28-metre, 150-tonne homage to the E-type on its 50th anniversary with a sculpture on the front lawn of Goodwood House. It will also be marking 60 years of Jaguar’s success in the Le Mans 24 Hours race and showing the new XKR-S.
Land Rover will be showcasing its new model, the Range Rover Evoque, the first ever Rangie to be made available with two-wheel drive. Morgan will be showing its (already ubiquitous) £30,000+ 3-wheeler - and probably demonstrating its wacky optional-extra graphics at the same time. The new Porsche Panamera Turbo S will be shown alongside racing cars such as the 917/30, the all-wheel drive turbocharged 961 and the 718 F2 single seater from 1960. The 102EX all-electric Phantom will take pride of place on the Rolls-Royce stand, showing that electric doesn’t have to mean small. Toyota and Lexus will be bringing current and classic competition cars including the Lexus LFA with Nürburgring Package. F1 grand prix winner Thierry Boutsen will be reunited with the Toyota GT-One Le Mans car; Frank Wrathall is in action in the 2011 BTCC Avensis; and former British Rally Champion Jonny Milner tackles the hill in his 800bhp Sprint Series Celica.